Apartamento Zulema is located in Aracena, less than 1 km from La Gruta de las Maravillas, in an area where hiking can be enjoyed. Guests staying at this apartment have access to a fully equipped kitchen. Leading onto a balcony, the apartment consists of 1 bedroom. The accommodation also provides guests with 1 bathroom with a bidet. Seville Airport is 97 km away. 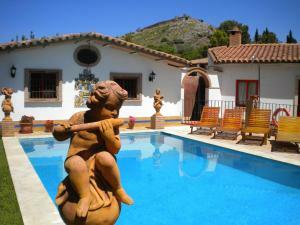 When would you like to stay at Apartamento Zulema ? Each day we'll check prices and send you an email for your selected dates at Apartamento Zulema. If you don't have specific dates but would like to check prices for say next weekend or say next month we can check the price too. Click to write a review and share your experience of Apartamento Zulema with other travellers.